The agreement was established with the signing of the Memorandum of Understanding (MoU) between Headquarters Maintenance and Engineering Support (HQ MES) and the National Additive Manufacturing Innovation Cluster (NAMIC), on 7 November 2017. 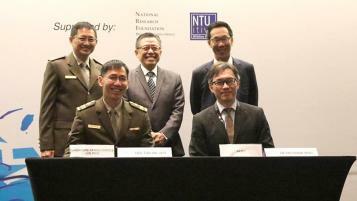 The event was held during the NAMIC’s Summit on Emerging Applications at Raffles City Convention Centre. With this arrangement, HQ MES will be able to leverage on NAMIC’s expertise in 3D printing as well as their network with research and industry partners. As part of the MoU, HQ MES and NAMIC will collaborate on the development of qualification standards and conduct research into the military use of 3D printing. Chief Maintenance & Engineering Officer Military Expert (ME) 6 Tan Mu Yen, who signed the MoU, said: “This MoU is not only the start of a great partnership with a credible national institution, it also puts MES at the heart of exciting and significant developments in the 3D printing realm so that we can push the envelope for MINDEF and the SAF.” More than 400 industry players attended the summit. They walked away learning about new design possibilities realised by 3D printing, as well as innovative materials in 3D printing applications in the construction, consumer goods and food.